Did you know? 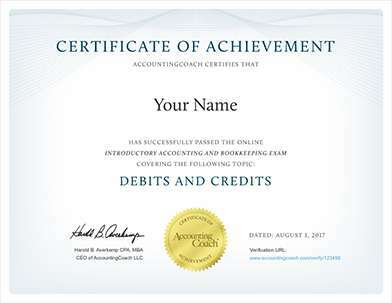 To make the topic of Accounts Receivable and Bade Debts Expense even easier to understand, we created a collection of premium materials called AccountingCoach PRO. Our PRO users get lifetime access to our accounts receivable and bad debts expense cheat sheet, flashcards, quick tests, and more. If we imagine buying something, such as groceries, it's easy to picture ourselves standing at the checkout, writing out a personal check, and taking possession of the goods. It's a simple transaction—we exchange our money for the store's groceries. In the world of business, however, many companies must be willing to sell their goods (or services) on credit. This would be equivalent to the grocer transferring ownership of the groceries to you, issuing a sales invoice, and allowing you to pay for the groceries at a later date. Whenever a seller decides to offer its goods or services on credit, two things happen: (1) the seller boosts its potential to increase revenues since many buyers appreciate the convenience and efficiency of making purchases on credit, and (2) the seller opens itself up to potential losses if its customers do not pay the sales invoice amount when it becomes due. Increase the amount due from customers, which is reported as accounts receivable—an asset reported on the balance sheet. A reduction of accounts receivable on its balance sheet. With respect to financial statements, the seller should report its estimated credit losses as soon as possible using the allowance method. For income tax purposes, however, losses are reported at a later date through the use of the direct write-off method. In this transaction, the debit to Accounts Receivable increases Malloy's current assets, total assets, working capital, and stockholders' (or owner's) equity—all of which are reported on its balance sheet. The credit to Service Revenues will increase Malloy's revenues and net income—both of which are reported on its income statement.